What started as an Panthers 'player of the game' joke morphed into an entire 'Spacey in Space' theme night where 20,817 fans turned out, including Kevin Spacey himself, the biggest crowd in regular-season franchise history. On a night that the Florida Panthers handed out cardboard cutouts of actor Kevin Spacey's face, the House of Cards star surprised fans by taking off his "Spacey Facey" mask as the videoboard camera panned around the stands. The Academy Award-winning actor attended the game Saturday night in support of the Panthers, wearing a sweatshirt showing an image of his face. It started as a joke a few months ago, when the Panthers issued a blue sweatshirt with "Spacey In Space" – his face floating in outer space – to the star of each winning game. After a win, that player would then hand the shirt off to someone else. 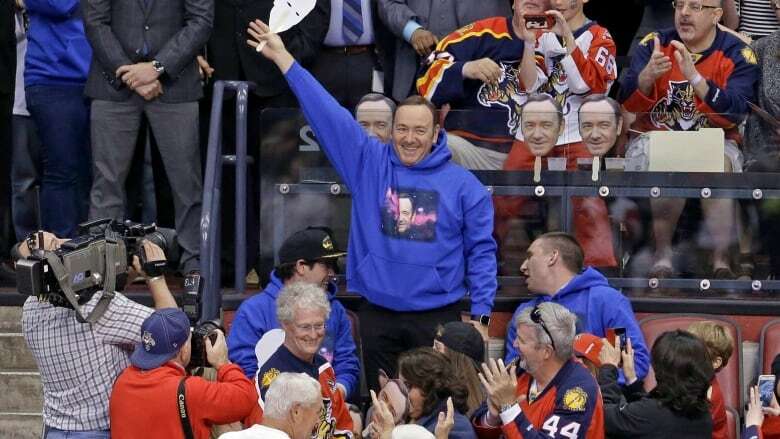 <a href="https://twitter.com/hashtag/FlaPanthers?src=hash">#FlaPanthers</a> new 'hero' piece of clothing is a blue sweatshirt w/ Kevin Spacey's face floating in space. It's as odd as it sounds. Spacey, an Oscar winner for The Usual Suspects and American Beauty, caught wind of it through social media. Whatever "Spacey In Space" means remains a mystery; players have kept their fascination with it a closely guarded inside joke. Unfortunately for the Panthers, they didn't get a chance to award the hoodie Saturday night after their 5-3 loss to the Detroit Red Wings. Spacey visited briefly with the players in their locker room after the game. "He came in after [and] we said hi to him," Nick Bjugstad said, "It wasn't as fun as if we would have won, the environment in the locker room. We're down a little bit. We definitely appreciate him coming down, supporting the team." Spacey's appearance on the scoreboard drew a huge roar from the crowd, many of whom also wore masks of his face. In fact, the crowd at 'Spacey in Space' night was 20,817 people strong, a regular season franchise record for the Panthers. "He congratulated me on my new contract and said he wanted a piece of it," said Aleksander Barkov, who got a $35.5 million US extension over six years. Even the Red Wings were excited by Spacey's appearance. "It was pretty cool seeing Kevin Spacey in the stands," Dylan Larkin said. "The crowd got pretty crazy, so that was a cool moment." The sweatshirts sell for $40. Proceeds go to the Florida Panthers Foundation and the Kevin Spacey Foundation.